Occupation of Kwajalein Island had reached an advanced stage by the morning of 4 February. The end of enemy resistance during the day could definitely be anticipated. The advance from the western beach had covered more than three fourths of the island's length and considerably more than three fourths of its area. 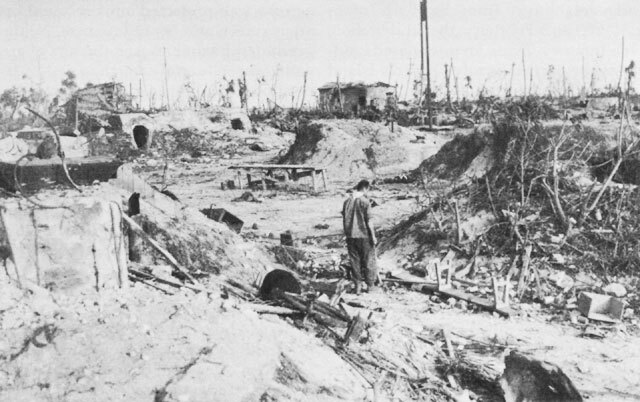 The stretch that remained was less than 1,000 yards long and 400 yards wide, a section containing the ruins of about thirty buildings amid the scorched and battered remnants of many trees.1 The ground north of Nathan Road was divided into segments by four east-west roads at intervals of approximately 100 yards and, some 300 yards farther north, by the loop of the island highway. The ocean shore was studded with pillboxes, gun positions, machine gun emplacements, antitank sea wall barricades, and shelters. Most of these works were oriented toward attack from the water rather than along the island from the south, and all had been heavily pounded by naval gunfire, artillery fire, and air bombing. The interior could be presumed to hold concrete shelters and earth-and-log bunkers resembling those that had proved to be such substantial obstacles to the advance of the previous day. communications would be disrupted, and the attack delayed. An exact knowledge of the location of various units still could not be had as morning approached. Company and battalion commanders did not know where many of the components of their units were, and radio contact with the rear continued to be poor. 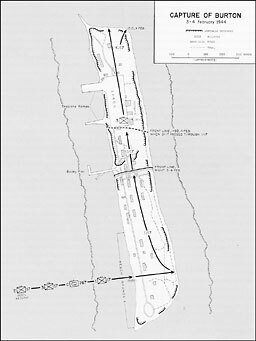 In the 184th Infantry zone of action, moreover, one entire section of enemy-held territory--that south of Nob Pier between Will Road and the lagoon--had not even been entered, although regimental and division headquarters assumed that it had been seized. 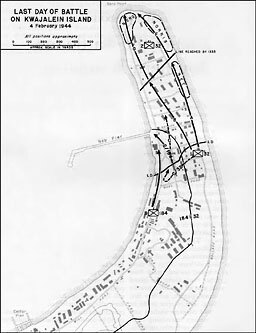 The 2d Battalion, 184th Infantry, which had been charged with the capture of this ground, had failed to enter it by dark on 3 February and planned to complete its mission early the next morning. Regimental orders for the 32d Infantry attack of 4 February called for the 1st Battalion to attack through the front lines held by the 3d Battalion, 32d Infantry, and by the 2d Battalion, 184th Infantry. It was to jump off at 0715, following fifteen minutes of preparatory fire by artillery and naval guns.2 In order to execute this attack, however, it was thought necessary to get all companies of the 1st Battalion into position before dawn. Company A was to form the right of the battalion line, Company B the center, and Company C the left. 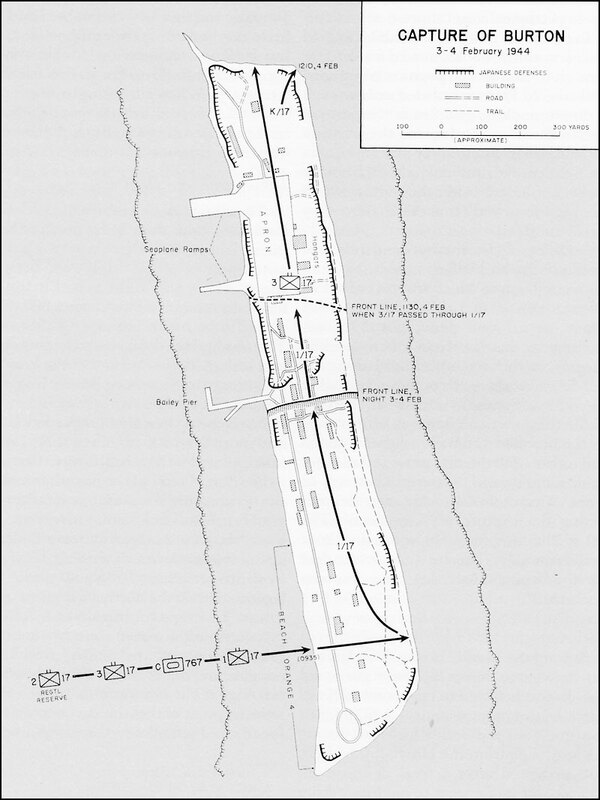 At the moment this plan was decided upon, Companies A and B were in reserve some distance to the left rear of the 3d Battalion line, and Company C was stretched out across the rear of the front in a badly disorganized state. The weapons platoon of the latter company was "missing" after becoming involved in the previous night's counterattack, having actually pulled back to the ocean shore. To launch the attack as early as possible, Colonel Logie about midnight ordered 1st Lt. Robert J. Kretzer, the Company C commander, to move his men to the lagoon side of the island before dawn. Company A would relieve Company C in its earlier position at approximately 0230. Lieutenant Kretzer, realizing that such a movement would be extremely dangerous under the conditions then existing behind the front lines, made a personal reconnaissance of the route his company would follow and visited the command posts of the 184th's advance companies, notifying them that Company C would be moving through the area later in the night. The action of Company B, as had been hoped by Colonel O'Sullivan, commander of the 184th Infantry, cleared out many of the Japanese who had been harassing the 2d Battalion and gave Company C, 32d Infantry, a chance to move through the front lines and proceed with its attack to the north. At approximately 1100 Lieutenant Kretzer pushed his company beyond Nathan Road for the first time, and shortly before 1200 the unit came abreast 1st Battalion, 32d Infantry, the right flank of which had reached Nate Road, two hundred yards north of Nathan, in a badly disorganized condition a short time before.11 Some of the tanks were approximately three hundred yards ahead, approaching the northern highway loop, but orders had been issued for the 1st Battalion to halt its advance pending relief by the 2d Battalion, 32d Infantry. The latter unit was to carry the battle for Kwajalein Island through to the end. of Japanese and Koreans continued to be a notable feature of the action of 4 February. Only a remnant of the original garrison was still capable of fighting. Fragments of the enemy force, after several days in isolation and without water, abandoned their shelters. From the first hour of the renewed attack until darkness, the compounds filled with a stream of prisoners. Company F, on the right, held its position until Company G brought the left wing in line; then both advanced. After going for seventy-five yards, Company F and its seven supporting tanks came to a large blockhouse into which the tanks directed their fire. 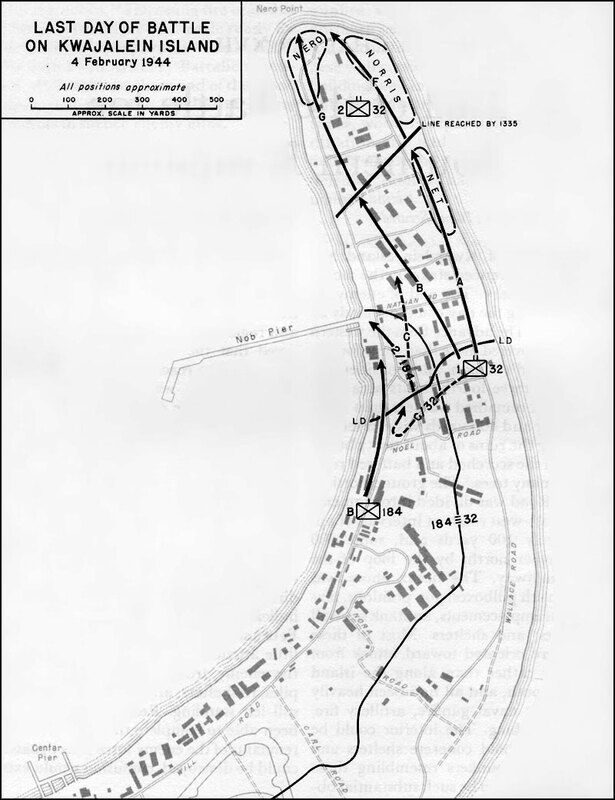 While Company F was thus engaged, Company G moved ahead for about a hundred yards, occasionally coming under fire from Company E. Both companies eventually resumed their progress with the left still far advanced; they cleared the surface and underground shelters of living enemy all the way to Nero Point at the end of the island. 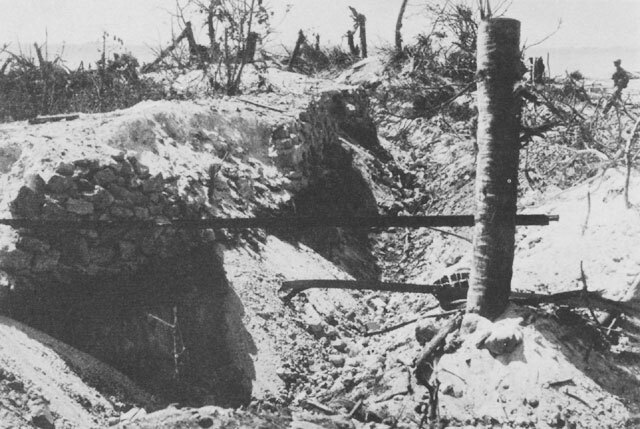 Camouflaged dugouts and ruined concrete blockhouses and shelters contained Japanese against whom it was necessary to employ scores of satchel charges, hundreds of grenades, and, ultimately, flame throwers. The 1st Platoon, Company G, on the extreme left, reached Nero Point at 1515 and reported its arrival to the regimental command post. The men then sat around on the beach and discussed the battle, oblivious of further combat behind them. The 3d Platoon, Company F, nearer the island's center, in the meantime came upon three long concrete shelters, side by side. The first was sixty feet long and about six feet above ground. Its left end had been blown off and a hole had been broken in the top near the right end, but the remainder held some of the enemy. Under command of S. Sgt. Raymond Borucki, the platoon started to pass the structure after hurling two satchel charges in an entrance. Finding that living enemy were still inside, they then threw in more heavy demolition charges and many grenades. Pvt. Elmer Collins and Pfc. Franklin S. Farr volunteered to investigate. They crawled to a door, walked in, and found themselves facing several of the enemy. Firing as fast as they could, they hurriedly backed out, dropped to the ground, and threw in grenades while their comrades fired into the doorway. Another squad covered a second entrance most effectively. When Collins and Farr re-entered, the only man they saw alive was the leader of the other squad, S. Sgt. Eugene M. Rider; he had just come in through the other entrance on the same mission. All the enemy were dead. After this operation, which required nearly half an hour, the 3d Platoon, Company F, took the two remaining shelters in a similar manner. Machine gun bullets began to whine over the heads of the 1st Platoon, Company G, on the beach. The men investigated. Soon they were back in action, mopping up circular 5-inch twin-mount gun positions and other places concealing small numbers of the enemy, and helping to establish a cordon within which to confine the remnants of the enemy at the island's tip. Company F's methodical movement among the enemy positions in its path subjected it to well-aimed rifle fire, which inflicted numerous casualties and delayed the last stages of the battle. Obstinate Japanese resistance continued as evening approached. About 1900, Captain Pence, commanding Company G, walked over to Company F's area to confer with Capt. Mark E. Barber, and was shot by an observant enemy rifleman before he could heed the warning shouts of men in Company F's forward line. Even with the battle's end so near, the troops became increasingly cautious. At dusk tanks were brought up to reduce the last 150 yards of the island. The tanks remained for only a few minutes, but they either drove to cover or killed the enemy riflemen who had been pinning down Company F. The attack again got underway and continued until 1920, when the entire northern end of the island was secured. Pacific war. The ship-to-shore movement had been conducted expeditiously and without serious hitch. Supplies flowed ashore and to the front lines smoothly and without interruption. The infantry-engineer teams assisted by tanks moved steadily, if somewhat more slowly than had been anticipated, up the axis of the island clearing the enemy from shelters and pillboxes. American casualties were light. All together, the battle for Kwajalein Island represented the ideal for all military operations--a good plan, ably executed. The Southern Attack Force, which had captured Kwajalein Island after establishing supporting units on Carlson, Carlos, and the channel islands, was also charged with the seizure of the many other islets and coral outcroppings of southern Kwajalein Atoll north as far as Bennett Island (Bigej) on the eastern leg of the atoll and Cohen Island (Ennugenliggelap) on the southwestern leg. Running north from Kwajalein Island on the eastern leg, these included in order, Byron, Buster, Burton (Ebeye), Burnet, Blakenship (Loi), Beverly (South Gugegwe), Berlin (North Gugegwe), Benson, and Bennett.19 Running north from Chauncey (Gehh) lay Chester, Clarence (Torrulj), Clement (Mann), Clifford (Legan), Clifton (Eller), and Cohen. No specific times for the capture of these outlying islands had been set, since the situation on Kwajalein Island was to be the determining factor in governing the timing of the landings on each. palm fronds and masked by the deep shade of tropical vegetation. To overcome this position the 1st and 3d Platoons, on the flanks, moved forward far enough to assault the position obliquely, while the 2d Platoon crawled near enough to direct machine gun fire at the parapet and to throw grenades into the position beyond it. For about forty-five minutes a fire fight ensued, and only after a bazooka rocket exploded inside the tent in which the Japanese were concealed were they finally subdued. for 1,200 yards. From the northern side of the seaplane area, a curving road with several spurs ran to the northwestern point. Trails extended along the ocean shore. In addition to the seaplane area and the roads, one of the most noticeable of the enemy's improvements at Burton Island was a concrete pier 160 yards long extending into the lagoon from a point almost midway along the coast. Known to the attacking force as Bailey Pier, it was shaped like an L, with the arm jutting north at right angles to the main stem, but with a spur extending obliquely southwest halfway out from shore. At the pier's base were several buildings and two high radio masts. The 17th Infantry was to hit Orange Beach at 0930, 3 February. The last details of the assault plan, including naval participation, were co-ordinated during the night of 2-3 February.30 The first four waves of the 1st Battalion had already embarked from Carlos Island in two LST's, and the first waves of the 3d Battalion were in two other LST's. The 2d Battalion, in reserve, was in a transport equipped with LCVP's. The 1st Battalion, 17th Infantry, commanded by Colonel Hartl, landed in LVT's with two companies abreast. Despite the mechanical failure of one tractor and a collision between two others, the first three waves made the shore without casualty.35 An LCI gunboat moved shoreward on each flank of the first wave, blasting the area near the beach with rockets and machine gun fire. The amphibian tanks and tractors directed their machine guns into the few palm trees that still retained enough foliage to conceal snipers. At various points about 150 yards offshore the reef was hit, and then the tractors ground their way through the foamy water to make the beach at 0935.36 Far off at the left, a machine gun on the end of the pier fired among the boats of the fourth wave and caused the first casualties of the landing. Four men were wounded. An LVT containing artillery observers drew machine gun fire from Buster Island but this was quickly silenced by counterfire from the 31st Field Artillery Battalion.37 While the men still afloat were meeting the fire, those on shore reorganized and formed a line of attack. When on the second morning the attack was resumed at 0730, the main enemy resistance had shifted to the eastern side of the island. The Japanese had reoccupied four pillboxes close to the American front line on the ocean side, and were able to hold up Company A until, with the aid of self-propelled mounts, the company took the positions.47 During the morning, a flight of five Navy bombers made two runs over targets that had been spotted with the aid of information from a prisoner. The planes dropped a total of two and three-quarters tons on an ammunition dump, a shelter, and a heavy machine gun that had an excellent field of fire across the hangar apron. Direct hits on these targets apparently disheartened the enemy. Not a single shot was fired by them at any later time during the operation.48 They remained buried in their dugouts until forced out or until they killed themselves. 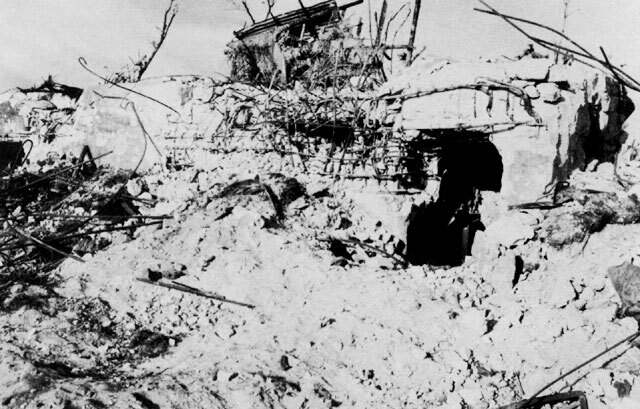 About a hundred yards from the line of departure, the advance platoon came across a well-protected bunker containing an unknown number of Japanese. Neither grenades, bazookas, nor clusters of grenades were powerful enough to destroy the position, so Captain Gritta, commanding officer, ordered it bypassed. The 1st and 3d Platoons then moved forward to meet an attack of Japanese infantry approaching from the south. After a brief exchange of machine gun and small arms fire, fifteen of the enemy were killed and one machine gun was captured, another knocked out. As the front line continued toward the center of the island, it came across another bunker, which appeared to be much stronger than the first. The Southern Landing Force thus completed its mission, with losses for the entire operation in southern Kwajalein reported as 142 killed, 845 wounded, and two missing in action. The best estimate of enemy losses was 4,938 dead and 206 prisoners, 79 of whom were Japanese and 127 Korean.60 Meanwhile, some forty-five miles to the north, operations of the Northern Landing Force against the sixty-two islands of the upper half of Kwajalein Atoll were also nearing completion. 1. Terrain description drawn from 7th Inf Div Opns Map, JICPOA Bull 48-44. 2. RCT 32 Jnl, 3 Feb 44, pp. 182-83. 3. Marshall, Kwajalein Notes, Vol. I, p. 90. 4. RCT 32 Jnl, 4 Feb 44, pp. 197-99. 6. Marshall, Kwajalein Notes, Vol. I, p. 91. 7. Ibid., pp. 76-77; BLT 184-2 Rpt, p. 9. 8. Marshall, Kwajalein Notes, Vol. I, p. 91. 9. BLT 184-1 Opns Rpt, p. 10. 10. BLT 184-2 Rpt, p. 9. 11. RCT 32 Jnl, 4 Feb 44, p. 203. 12. BLT 184-2 Rpt, p. 9. 13. RCT 184 Jnl, 041350 Feb 44. 14. RCT 32 Jnl, 4 Feb 44, p. 204; RCT 184 Jnl, 041349 Feb 44. 15. RCT 32 Jnl, 4 Feb 44, p. 207. 16. Marshall, Kwajalein Notes, Vol. I, pp. 102ff. Unless otherwise noted, the action of the 32d Infantry on the afternoon of 4 February is drawn from this account. 17. RCT 32 Jnl, 4 Feb 44, p. 212. 18. 7th Inf Div FLINTLOCK Rpt, Vol. VII, G-4 Rpt, p. 127, Annex C, Incl 3. 19. Byron, Buster, Burnet, and Benson had no known native names. See JICPOA Bull 53-43, 1 Dec 43, map facing p. 2; 7th Inf Div FLINTLOCK Rpt, Vol. II, FO 1, 19 Feb 44, map. 20. 7th Cav Rcn Tr Rpt, p. 6. 22. Marshall, Kwajalein Notes, Vol. II, pp. 22-27. Unless otherwise noted, the account of the capture of Chauncey Island is drawn from this source. 24. RCT 17 Rpt, p. 5. 25. Ibid., S-3 Rpt, p. 3. 26. 7th Inf Div FLINTLOCK Rpt, Vol. II, 7th Inf Div FO 4, 1 Feb 44, Opns Map. 27. JICPOA Bull 48-44, pp. 21ff. Also see above, Ch. XIII, p. 213. 28. 7th Inf Div FO 4, 1 Feb 44, Opns Map and p. 1. 29. RCT 17 Rpt, p. 5. 30. Ibid., S-3 Rpt, p. 3. 31. 145th FA Bn AAR, p. 172; TF 51 Marshalls Rpt, Incl E, p. 4. 32. TF 51 Marshalls Rpt, Incl E, App 2, p. 10. 33. 7th Inf Div FLINTLOCK Rpt, Vol. XII, 7th Inf Div Arty Rpt, Jnl, 3 Feb 44, Msgs 13, 87; 31st FA Bn AAR, Jnl, p. 90; 145th FA Bn AAR, p. 173. 34. 7th Inf Div Arty Rpt, Jnl, 3 Feb 44, Msgs 23, 26; RCT 17 Jnl, 3 Feb 44, Msg 17; TF 51 Marshalls Rpt, Incl F, p. 5. 35. Marshall, Kwajalein Notes, Vol. II, pp. 31, 42. 36. RCT 17 Jnl, 3 Feb 44, Msg 14. 37. 31st FA Bn AAR, p. 68. 38. Marshall, Kwajalein Notes, Vol. II, pp. 32-33, 43. 39. 7th Inf Div FLINTLOCK Rpt, Vol. VI, 7th Inf Div G 3 Jnl, 3 Feb 44, Msg 39. 40. Marshall, Kwajalein Notes, Vol. II, pp. 34-35. 41. Ibid., pp. 36-38; RCT 17 Rpt, p. 7. 42. Marshall, Kwajalein Notes, Vol. II, pp. 35 36; RCT 17 Rpt, Engineers Rpt, p. 3. 43. Marshall, Kwajalein Notes, Vol. II, pp. 48-51. 44. RCT 17 Jnl, 3 Feb 44, Msg 102; 7th Inf Div FLINTLOCK Rpt, Vol. VIII, S-3 Periodic Rpt No. 2, 3 Feb 44. 45. RCT 17 Rpt, Medical Rpt, FLINTLOCK, p. 52; 7th Inf Div Med Bn AAR, p. 14. 46. RCT 17 Rpt, p. 6, and Jnl, 4 Feb 44, Msg 9; Marshall, Kwajalein Notes, Vol. II, p. 38; 31st FA Bn Jnl, 4 Feb 44. 47. RCT 17 Rpt, p. 7; Marshall, Kwajalein Notes, Vol. II, pp. 39-40. 48. TF 51 Marshalls Rpt, Annex F, p. 5; Marshall, Kwajalein Notes, Vol. II, pp. 39-40. 49. RCT 17 Rpt, p. 7 and Jnl, 4 Feb 44, Msgs 55, 60; 7th Inf Div G-3 Jnl, 4 Feb 44, Msg 57. 50. RCT 17 Rpt, pp. 7, 20; 7th Med Bn AAR, pp. 14-15. 51. RCT 17 Rpt, pp. 6, 7, and Jnl, 3 Feb 44, Msg 76, 4 Feb 44, Msgs 14, 39; 708th Amph Tk Bn, Sp Action Rpt, 12 Mar 44, p. 3. 52. RCT 17 Rpt, pp. 9-10. 53. Ibid. ; Marshall, Kwajalein Notes, Vol. II, pp. 55-56. 54. Marshall, Kwajalein Notes, Vol. II, pp. 56-64. 55. RCT 17 Rpt, pp. 7-8. 56. 7th Cav Rcn Tr AAR, pp. 9-10. 57. Ibid. ; 7th Inf Div G-3 Jnl, 5 Feb 44, Msgs 5, 7; TF 51 Marshalls Rpt, Incl E, App 2. 58. RCT 17 Rpt, p. 9; 7th Inf Div G-3 Jnl, 5 Feb 44 pp. 68, 88. 59. RCT 17 Rpt, p. 9; 7th Inf Div G-3 Jnl, 5 Feb 44 pp. 149-51. 60. 7th Inf Div FLINTLOCK Rpt, Vol. III, G-I Rpt, pp. 18, 19, 70.